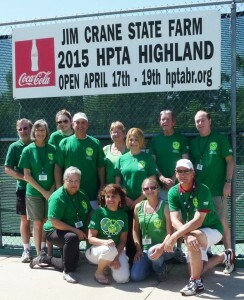 2015 HOTT Team members (kneeling l-r) Joycelyn LeBlanc, Christine LeBlanc, Kari Klotzbach, and Gary Mollere (standing l-r) Bill Sanner, Lisa Sanner (tournament director), Erin Achberger, Rusty Jabour, Debbie Klotzbach, Sandra Harshbarger, Mike Doyle, and Mike Fournet. Not pictured are Jim Strathe and Barry Valure. 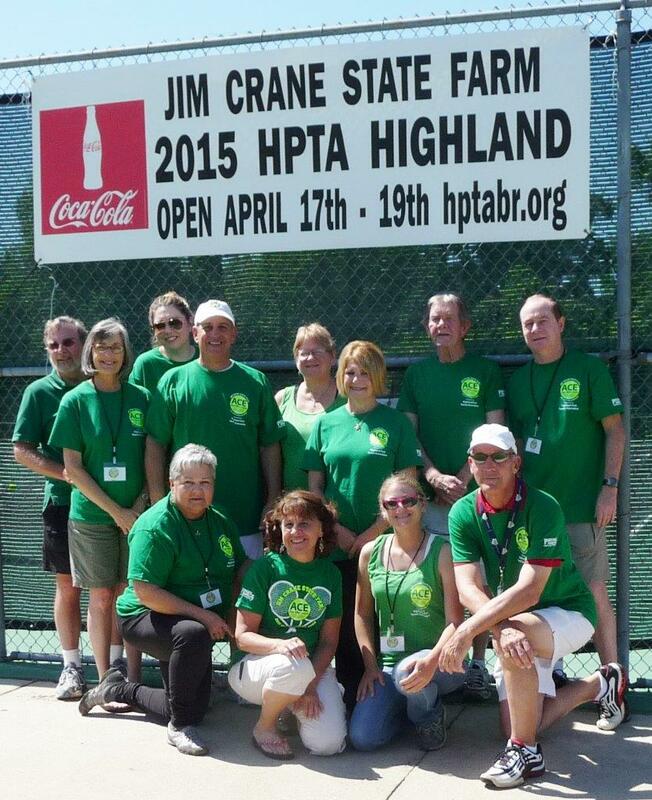 The Highland Park Tennis Association and its Highland Open Tournament Team are proud to announce that the 2015 Jim Crane State Farm Highland Open raised $22,363 for the Cystic Fibrosis Foundation. The tournament hosted 119 men’s and women’s doubles teams (238 players) and was held April 17-19 at BREC’s Highland Park Tennis Center in Baton Rouge. The 2015 total was the second-highest in the Highland Open’s 33-year history, surpassed only by the 2011 total of $23,000. The funds were raised from a variety of sources, including corporate and business donations, tournament entry fees, a raffle and silent auction, and the “65 Roses” campaign. Thanks to all of the individuals, businesses and organizations that helped us achieve our goal! Click on this link to see the final tournament results: Results here. Our 2015 Champions, Finalists and Consolation Winners! Between February and the tournament’s end, HPTA conducted its annual 65 Roses Campaign to benefit the Cystic Fibrosis Foundation. Many thanks to Wendy Parrish for sponsoring the first rose of the campaign this year, and BIG THANKS to the 80 Roses sponsored, helping us exceed our 65-Roses goal! Click here to see the entire list of 2015 Rose Sponsors. Academy Sports, BREC Tennis Dept., Coca-Cola Bottling Co., Cortana Kiwanis Club, Debbie Klotzbach, Gambino’s, Iberia Bank, Izzo’s Illegal Burrito, Raising Cane’s Chicken Fingers, Safelite Auto Glass, Sandra Harshbarger, Stacia Welch, Boo Rozas, Brew-Bacher’s Grill, Capital City Grill, Celina Johnson, Lamps and Lighting, Louisiana Nursery, Nothing Bundt Cakes, Merci Beaucoup, Red Stick Spice Company, Runnels Elementary School Library, TJ Ribs, KR Martin, McAllister’s, Owen’s Collision, Cox Communications, Kiss My Nails, Louisiana Nursery and Salon Vitae.